Nothing says “I Love You” like a bouquet of fresh roses. Don’t limit yourself to just roses though–incorporating their favorite flowers into the mix is especially thoughtful. A classic gift from the heart, this stunning bouquet of two dozen red roses is a grand gesture of love and affection. Paired with a delicious box of chocolates, this gift arrives fresh from the farm in a custom designed floral box, specially designed to create a beautiful presentation. 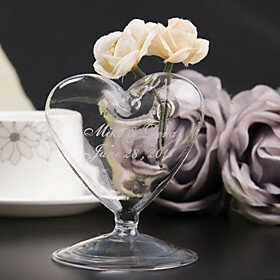 This personalized glass heart-shaped vase will make the roses more special. And after the Valentine’s Day, this vase also makes a beautiful addition to table decorations and centerpieces. Whether they enjoy sweet caramels or savory truffles, they’re sure to appreciate a box of gourmet goodies. 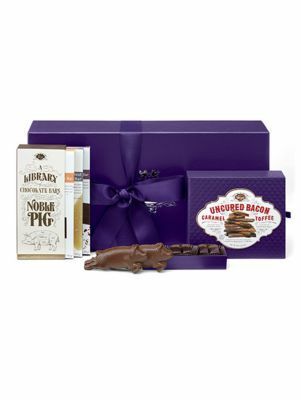 If they’re really adventurous, try this Bacon & Chocolate Gift Set. A gift set that gathers every member of the celebrated chocolatier’s bacon & chocolate family, combining applewood smoked bacon and Alder wood smoked salt with chocolate. It comes with 41% milk chocolate or 62% dark or crunchy toffee. And they also make fantastic chocolate-spotted pancakes. This classic arrangement makes the perfect wine gift no matter the occasion! Inside an cloth-lined wire basket, your recipient will discover a rich California Cabernet Sauvignon that’s surrounded by a traditional assortment of irresistible gourmet snacks. 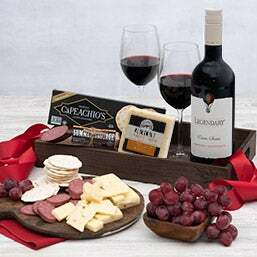 Complete with sharp cheddar cheese, thick olive oil hors d’oeuvre crackers, and a premium snack mix, this gift is sure to delight the wine lover in your life. Have a wonderful, lovely, romantic Valentine’s Day and be sure to give tons of hugs and kisses.